Despite her fiancé’s disapproval, Doctor Lilly Corbett decides to spend the first six months after graduating from medical school in Boston interning at a rural coal camp in Skip Rock, Kentucky. While her beau, Paul Hamilton, can’t understand why anyone would want to leave the city where he spent most of his life, the part of Kentucky that Lilly grew up in wasn’t all that different from Skip Rock. But no matter how similar an upbringing she had, nothing can prepare her for the reception that awaits her in Skip Rock. The miners believe that a woman in the mines is bad luck, and even the women are reticent to accept her as a trained medical professional. The doctor she was meant to be training with has died just days before she arrived, and to begin with, Lilly can’t wait for her internship to be over. But as she spends more time caring for the people of Skip Rock – setting broken limbs, birthing babies, trekking across rivers for house calls and even stitching up a cow – Lilly becomes accepted as a member of the community, especially when it is revealed that she has relatives there. As she develops a fledging relationship with the mysterious Joe Repp, who bears a striking resemblance to a boy Lilly grew up with, and makes friends with many of the inhabitants of Skip Rock, Lilly can’t help but want to stay in this town and help these people. When she’s offered the chance to remain in Skip Rock after her internship finishes, Lilly has a difficult choice to make – does she do the sensible thing and return to Boston to marry the reliable Paul, or take her chances on Skip Rock and a man with a fake name who is in the town under false pretences? Considering how many historical romances are released by the CBA every year, you’d think that I’d get bored of this genre, or that authors would run out of original ideas. I’ll admit, every now and then I read a book that seems just a little bit too similar to something I’ve already read, but novels like Skip Rock Shallows prove that authors are not running out of steam when it comes to making their characters unique. Yes, a female doctor has been done before by Mary Connealy, but Doctor in Petticoats and Skip Rock Shallows couldn’t be more different. If Skip Rock Shallows reminded me of anything in particular, it was the writing of Janette Oke. The plot was very slow moving, and not as structured as more recent historical novels, often moving from one episode to another rather than having a particular arc or direction it was heading in. While this isn’t a style of writing that I’m particularly fond of – I prefer more structure to my novels – it did make for an easy, relaxing read. If Oke’s continued popularity has anything to suggest, a lot of readers will be pleased that Skip Rock Shallows contains some of the elements of the older novels in this genre. While I wasn’t aware that Skip Rock Shallows was part of a series until I started reading, I didn’t have any trouble getting to know the characters, and necessary details from other books are summarised without detracting from the current story. I don’t think that you have to read the other Copper Brown novels before starting Skip Rock Shallows, but I’m definitely intrigued to see whether they have the same relaxed pace as this book. Sometimes I found it hard to grasp how Lilly’s character was developing, mainly because the story would skip several weeks or months at a time. While the reader was always told how long had passed since the last chapter, I wasn’t particularly fond of this style of storytelling. It often meant that we were told how friendships had progressed during that time and I sometimes felt that I was missing out on witnessing certain developments. Lucy’s relationship with Joe was similarly treated. They engaged in a couple of conversations – even Lucy and Paul spoke more over the course of the novel, and he spent the majority of it in Boston – and then a few chapters later were declaring their love for each other. (This is a romance novel, so I’m not spoiling the plot. If you don’t know that Lucy and Joe are going to fall for each other from reading the synopsis, you’re probably not too familiar with this genre). I liked Lucy and I liked Joe, but I just wasn’t convinced by the progression of their relationship. There were hints that they’d known each other as children and that meeting again made them fall in love, but I just didn’t buy it. It was far too much “love at first sight” for my liking. I’m afraid the way the romantic aspect of this book was approached was its biggest downfall for me. I wished that Lilly and Joe had spent more time together and really convinced me of their love, but ultimately, I didn’t find their professions of love genuine and this stopped me from really caring about whether they’d get together by the end of the book. If you’re looking for a book that will grab you from the first page and keep you gripped with suspense and anticipation, Skip Rock Shallows definitely isn’t the one for you. Rather, I’d say this is a good book to read if you know you can’t commit to reading more than a few chapters at the time. It’s easy to put down and later reimmerse yourself in Lilly’s doctoring and explorations of Skip Rock. Lilly’s profession, as well as some of the more unusual characters in the town, were what made this novel really stand out for me, and why I’d recommend it in spite of my personal opinions on the writing style. 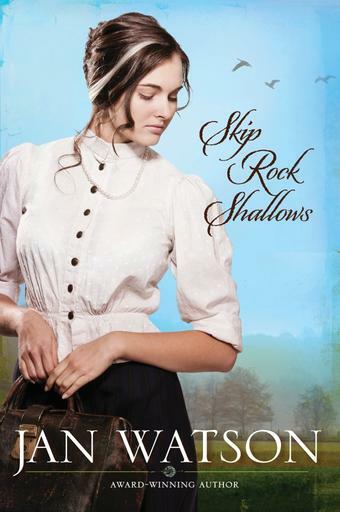 While I was disappointed in how rushed Lilly and Joe’s relationship was, Skip Rock Shallows is still worth reading for the mining and doctoring details and the secondary characters. Review title provided by Tyndale. Have you read any other books by Jan Watson? Her books are kind of a series, in the since that they follow the same family around. The first few books are about Lilly's mother who was a midwife in the Kentucky hills where she grew up. No, I didn't even realise this was part of a series until after I requested it to review! This one seemed to work really well as a standalone, but it might be interesting to read some of the earlier ones.